Watford manager Gianfranco Zola has said the club is investigating alleged racist abuse aimed at their under-19s team during a match in Italy. The Watford youngsters were trailing Italian side Latina 1-0 in a Wojtyla Cup fixture on Wednesday when they were taken off by coach David Hughes. "What happened is not nice and if there is something we can do, we'll do it." The Hornets boss said they would work with the tournament's organisers in Italy to find out what happened. The Wojtyla Cup was created in memory of Pope John Paul II, who was born Karol Wojtyla. The tournament's website says: "Young football players from different countries, cultures, religions and races will meet and through football will be fostered to know and to face each other, learning to respect their differences. "[The tournament] wants to spread the values of fairness, the opening to diversity." 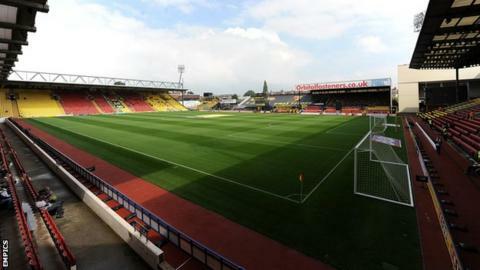 Watford, who are owned by the Italian Pozzo family, are the first English team to play in the competition's nine-year history. Before their match with Latina, Watford had beaten Bulgarian team PFK Lokomotiv Sofia 2-1 and played out a goalless draw against Slovakian outfit FK Senica. The anti-discrimination group Kick It Out said they had seen reports of racism at the match. "Kick It Out is making enquiries to establish the full facts surrounding an alleged racist incident which took place in the Wojtyla Cup fixture between Watford Academy and Latina Calcio," a statement from the group said.